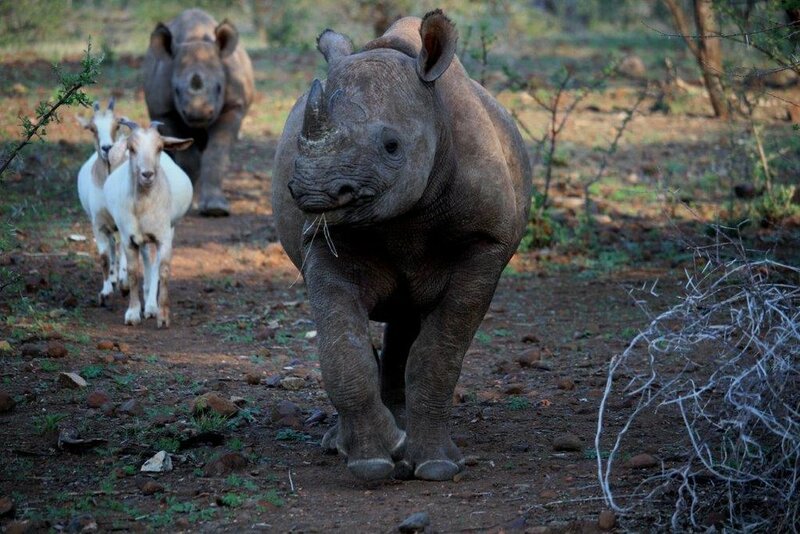 Sabi arrived in the middle of the night (as they usually do), at the end of April 2014. He was a casualty of a poached mother, killed on another Conservancy. He was so small when we removed him from the transport crate, that my son lifted him out under his arm, not what you would expect to happen with a rhino calf. We think he was a week to 10 days old, still had his umbilical cord! He settled down to his new life with us and readily took to his feeds, which were very regular at that age, 5 to 6 times a day. He was fed on skimmed milk powder with added glucose, and after about a month we started him on e.pap, similar to Pronutro, and he thrived on that diet. After a few months, he was introduced to game nuts, which once he became accustomed to them, were a firm favourite. After we had had him a few days, we managed to get 2 young goats to keep him company, as we don’t encourage too much human contact, although at that age, it is difficult not to have quite a bit of contact with them. He and the goats got along famously, and all through the winter months, the 3 of them slept under an infra red light (for warmth) in their hay filled boma. Sabi grew very nicely, he was actually quite a little thug, and we put big tractor tyres in the boma that we could jump into when he got too rough. During the day he would go out into a paddock with ‘his’ goats, so that he could browse naturally, and in the evening, for security, we shut him in the boma, where he had various cut browse to feed on through the night. Squirt was about 6 weeks old when he came to us – he was born to a blind mother, who at the time was being held in a boma because of her condition. Obviously long term boma conditions are not ideal, especially from new born for the first few weeks. He started scouring, so the decision was made to remove him from his mother and try and hand raise him, because black rhino calves are generally very easy to manage. Squirt was a bit of a different story because of his diarrhoea and his condition worsened quite quickly. Fortunately, Penny English was playing surrogate mother at the time and she called in Dr. Chap Masterson, who was actually on the Conservancy for a few days with his family, and he managed to stabilise him. He still had his ups and downs, and Penny had a full time job to keep him going. Eventually they decided that it may be better if he came down with a view to ultimately join Sabi. Obviously because of the age and size difference, 7 months, they were kept separate for a couple of months until we thought Squirt could deal with the ‘thug’ Sabi..
Squirt was still not physically well and went through periods of refusing his feeds, very worrying ! It was decided that we would load him up and send him off to the vet in Bulawayo, which was undertaken by Natasha Anderson and Roy Lenton… it was a long day, but worth it, as they decided the cause of his ups and downs was stomach ulcers. Long story short, Squirt was put onto ulcer treatment for 2 months, no mean feat. Tendai, who was the rhino minder, had the unenviable task of crushing 20 tablets a day , putting it into a minute bit of glucose water, and fooling Squirt into thinking it was palatable…he managed to do this by feeding him a banana straight afterwards….it does not take too much to fool a rhino !! After a couple of months we united Sabi and Squirt, they had had contact through a fence since Squirt’s arrival, and it went pretty smoothly – a bit of snorting and chasing around the boma, but nothing too serious. They then became very firm friends, and along with the goats, spent their days (and months) in the paddock and their nights in the boma. Many, many gallons of milk were mixed and fed to them over their duration here, more than I would ever like to calculate!! They grew very well, even Squirt after his bad start, and we decided that they should be ok to go back into the wild, they were by now 25 months and 18 months respectively. Their re-location was done in May and went very smoothly – judging by the camera trap pictures, they have settled very well in their new surroundings and are looking in great condition and very relaxed. The U.S. Fish and Wildlife Service today made a preliminary decision regarding the conservation status of lions, proposing to protect the lion under the U.S. Endangered Species Act.